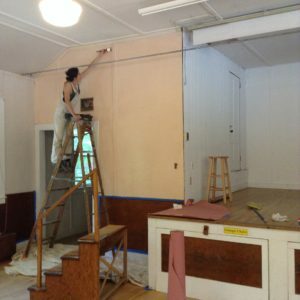 An intrepid crew of painters began painting the main Hall on August 4th. 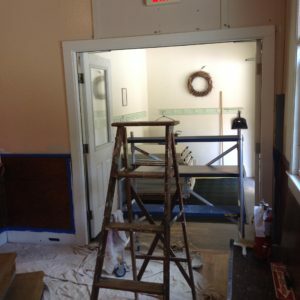 Organized by Alison Forrest (who took the pictures so she doesn’t show up in them), a group of volunteer Grange members and friends began painting the trim and walls. The Stage-end wall is the first to get a new color; the other 3 walls will also be painted–in a lighter color, FYI. Keep watching to see the new colors–or better yet, help out! Contact Alison at: feedkidswell@hotmail.com to find out when the next painting session takes place. 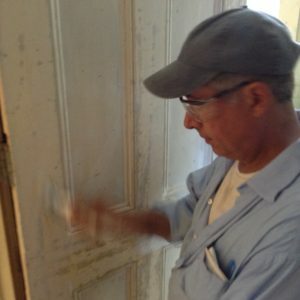 Joe has also been scraping paint from the exterior walls, and priming the bare spots–he’d like to have others to work with as well. Contact him at joeblakely640@yahoo.com to find out more. 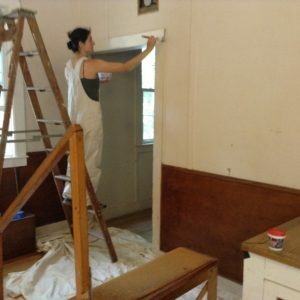 In the pictures, Marisa, Joe, and Hap are painting; other volunteers have already removed all the pictures, quilts, bulletin boards, notices and other items from the walls, and washed them too! Lots of work goes into a project like this, but with a crew of people sharing it, it’s impressive how much gets done.